How can I colourise a sprite anew? 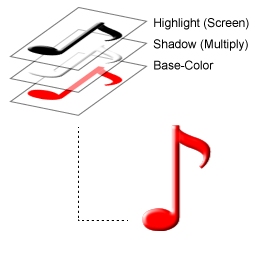 If your color was red, you would then color the note (all the black parts) with the same red. What you would need in addition, is a grayscale image with the shading of the note. Then combine the shading with the flat color by using blend-modes like Multiply and/or Screen. Another, probably simpler approach would be to just have a grayscale image where you would multiply each color component with your selected color. So if you have a gray value of 0.5, and a red color RGB(1.0, 0.0, 0.0), that would result in RGB(0.5, 0.0, 0.0) for the given pixel. Of course you could just use the shadow layer if you don't need the highlights (which is basically the same as the simpler approach mentioned above). Make a greyscale (or just white) version of the image you want to show, with a suitable alpha channel. Use the vertex color to "dye" the image. Vertex color multiplies each channel, so white x red = red, 50% grey x red = 50% red, and so on. Not the answer you're looking for? Browse other questions tagged opengl sprites color or ask your own question. How to change colors of texture in lwjgl? Trying to understand light on Opengl, how to simulate a realistic sun light? Math behind XNA's spriteBatch.draw() color parameter? Best strategy on VAO and texture coordinates for voxel rendering?